Allen & Heath Xone 4D DJ Mixer DJParts - All Variety of Parts that DJ Needs. The Xone:4D continues the seamless integration of computer-based digital media into the traditional DJ workspace, but with a further enhanced feature set. 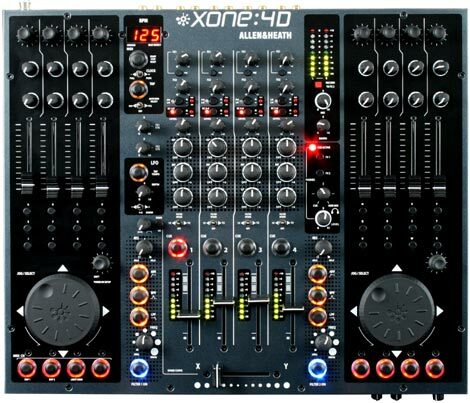 Combining a fully featured, high specification professional analogue DJ mixer with 105 MIDI controllers and 227 MIDI messages, a completely new, high-end, 96 kHz / 24-bit 20 channel Allen & Heath-designed USB 2.0 soundcard, the progressive XONE:4D has been developed in conjunction with some of the world’s most cutting-edge DJ/producers. New features for the 4D include the new 20-channel USB 2.0 soundcard, a completely new BPM counter, assignable LFO with step VCF-filter and fresh new paint. Filter assignable LFO with depth control and brand-new editable fader step-filter function. Completely re-designed and functionally improved BPM detection circuit. No software configuration utility – all front panel switched. New record output – FX2 RCA outputs can be switched to a RCA record output. NEW! 2 separate layers of MIDI controllers with control pickup algorithm ensuring a smooth transition between layers.